One of the best websites we have found for you to “brush up” on your signing skills is a website designed by Bill Vicars, Ed.D. called www.lifeprint.com. To learn more about the fantastic man behind the site, please click here to be redirected to his bio. When you go to www.lifeprint.com, you will see words listed alphabetically on the left-hand side of the page in blue text. If you click on one of these words, you will be shown the appropriate ASL sign for that word. However, if you are a very beginner in the the seedling stage of your ASL development, we suggest you check out Dr. Vicars First 100 Signs Tour. This section is based on about a hundred sign concepts that are frequently used between parents and their young children. Remember, there is much more to learning ASL than just memorizing signs. 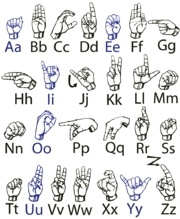 ASL has its own grammar, culture, history, terminology and other important information. It takes time and effort to become a “skilled language user.” But you have to start somewhere if you are going to get anywhere–so dive in and enjoy… First 100 Signs Tour. Many thanks to Dr. Vicars for allowing us to redirect you to his website. We think you will find his information honest, from the heart, and enlightening.